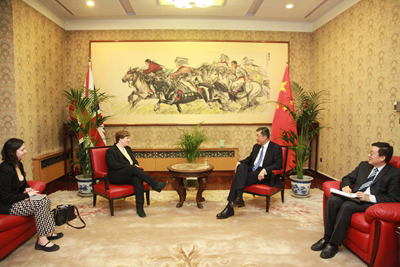 On 24 October, Ambassador Liu Xiaoming met with Labour MP and Shadow Foreign Secretary Emily Thornberry at the Embassy. Ambassador Liu spoke positively of the Labour Party's historic contributions to China-UK relations. Despite many uncertainties after the Brexit referendum, the good momentum in the bilateral ties remained unchanged, said the Ambassador. China is willing to work with the British people from all walks of life, including the Labour Party, to deepen the exchanges and cooperation in various fields and to join hands with the UK to contribute to the "Golden Era" of China-UK relations. Shadow Foreign Secretary Emily Thornberry shared her views on the current political situation in the UK, the prospect after Brexit and the Labour Party's foreign policies. She said that the Labour Party attached great importance to developing partnership with China and stood ready to strengthen exchanges and cooperation, especially youth and cultural exchanges, between the UK and China so as to make contribution to the "Golden Era" of UK-China relations. The Ambassador and the Shadow Foreign Secretary also exchanged views on international and regional issues of shared interests.